In the year 1996, members of the Association started their activity for the purpose of creating a high-quality standard in the psychosocial interventions provided to children and young people with cancer and their families. It is our wish that this program will become an integral part of the treatment strategy in the pediatric oncology units, since it’s already been successfully implemented in the main treatment centres in Romania and the Republic of Moldova. The success and uniqueness of this program lies in the fact that it runs DAILY, from Monday to Sunday, in all the above-mentioned centres. It was adapted to all age groups, not only as group projects, but also as bedside activities for children undergoing treatment. The consistency in the way the Little People Association implemented each therapeutic activity, focused on the needs of each patient in particular, produced significant results in the various aspects of fighting the disease, accepting hospitalisation, compliance to treatment and pain management. Moreover, it reduced significantly the anxiety towards medical procedures, bringing courage and hope to their spirits and, last but not least, it helped create a comfortable environment where the sick children could feel that they’re just like everyone else their age, by having access to fun activities and games, as well as a secure environment for harmonious psychosocial development. Every day spent in a hospital can be quite overwhelming for patients and their families! We are aware that having cancer is no fun at all, yet you must be able to enjoy yourself, even when you’re fighting against the disease! A program in a class of its own in Romania and across Europe is the Temerarii Club – the community for cancer survivor teenagers and young adults, founded by the Little People Association in the year 2006, in Cluj-Napoca, from the desire to provide a strong voice for the young people who finished their cancer treatment. Through the Temerarii Club, the Little People Association offers support not only to the young people who completed their treatment, but also to their siblings, providing peer support and facilitating the successful reintegration of patients to teenage and young adult life after treatment. Presently, the club numbers over 300 members aged between 14 and 29 years, from more than 85 different locations in Romania. For more information on Temerarii, click here. When celebrities meet the little superheroes from the hospital! The Little People Association uses every opportunity to bring the children and young people with cancer as close as possible to various celebrities, movie, music and sports stars, as well as pretty much everyone who can encourage the children and young people in their fight against the disease, facilitating the children’s access to as many cultural and sports events as possible, so that the long hospitalization period will not affect their contact with the “outside” events. They have the opportunity to receive autographs, take pictures, listen to advice and encouragement from celebrities and, last but not least, to watch them live in concerts, games or shows. Here are some of the famous people who visited the children and young people affected by cancer: Beyonce, Sir Alex Ferguson, Inna, Smiley, Oana Pelea, Ștefan Hrușcă, Buena Vista Social Club, Harlem Globetrotters, as well as famous soccer teams, such as Manchester United, Manchester City, Chelsea FC, Liverpool etc. The Little People Association places a big emphasis on providing support to the parents and the families of the cancer patient. Thus, it provided every pediatric oncology unit in the country with a very comprehensible Parent Guide (Ghid pentru Părinți), distributed for free to all parents at the time of hospitalization. Hearing the news of the child’s diagnosis may induce a powerful shock to the whole family. This guide comes to the parents’ aid, in an easily-accessible language. It includes various topics, such as: pediatric cancer, types of necessary investigations and procedures, cancer treatment, a list of all the pediatric oncology centers in Romania, as well as many encouraging and hope-giving messages from the young cancer survivors. The Little People Association is fully dedicated to the pediatric oncology field, supporting national initiatives, collaborating with SROHP – Societatea Română de Onco-Hematologie Pediatrică (Romanian Society of Pediatric Hematology and Oncology) and doing everything that’s necessary to improve the current situation: renovation projects in hospitals, supplying medical equipment, covering costs for various diagnostic investigations, or providing the medicines that are so needed. We deeply appreciate and admire the pediatric oncologists whom we work with, for their efforts, nothing short of superhuman, as well as for their dedication to their patients. It is both our and their hope and desire that, one day, all the children in Romania who have been in any way affected by cancer will have access to medical assistance and facilities at European standards and that the psychosocial services we provide will become an integral element of the multi-disciplinary team’s efforts within every pediatric oncology unit in Romania. The Little People Association has harmonious work relations with all the pediatric oncology units in the country and enjoys outstanding appreciation from health professionals. We also collaborate very closely with the psychologists employed by the hospital and together we do everything within our power to provide patients with the optimal conditions for harmonious psychosocial development. The Little People Association invests a lot of thought and attention into volunteer programs, treating them with a great deal of professionalism and commitment. For the support programs run in the 9 centers, we started collaborations with 7 universities and trained tens of Little People volunteers, most of them psychology students or graduates. The volunteers have to go through a very rigorous selection process, having then the opportunity to participate in specific training courses, supervision, experience exchange in other pediatric oncology units and an annual national meeting of all volunteers. This 4-day meeting is particularly important to volunteer training, as it includes specialized workshops on pediatric psychology and oncology; it provides relevant information on the intervention programs within the hospital; it offers the opportunity for experience exchange, networking, team-building and training as part of a non-formal and experiential workshop. The Little People Association is the only association in Romania to provide this type of services nationwide for volunteer training, bringing, as a result, a high level of quality and commitment to the services we provide for the children and young people with cancer. Going in the hospital as a volunteer is an added responsibility, as well as a privilege to be an integral part of the complementary treatment which this program provides in the fight against cancer! In order to offer volunteers a well-structured framework for the progress of the support program, the Little People Association developed a Volunteer Guide, which includes information about the objective of the „Nu mi-e frică!” (“I Am Not Afraid!”) program, a description of the concept, rules of conduct and useful information on pediatric cancer and hospitalization. For more information on volunteering opportunities, click here. Through the funds from the Poți Și Tu! Campaign (“You Can Too!”) as well as donations from different companies, the Little People Association succeeds in providing significant material support to the pediatric oncology units. So far, 4 play and therapy rooms have been fully renovated and equipped for the children and young people with cancer hospitalized in the Emergency Hospital for Children “Sf. Maria” in Iaşi, Emergency Clinical Hospital for Children “Maria Sklodowska Curie” in Bucharest, the Oncology Institute “Prof. Dr. Al. Trestioreanu” in Bucharest and the Oncology Institute ”Prof. Dr. Ion Chiricuta” in Cluj-Napoca. Also, the pediatric oncology doctors can always count on help from the Little People Association in regards to funds needed for catheters for the sick children, for purchasing medicines that are difficult to find and financial support for the young people who relapse. The Association even had the opportunity to initiate a number of donations in the form of state-of-the-art, as well as renovating and furnishing different hospital rooms. See our renovating projects here. 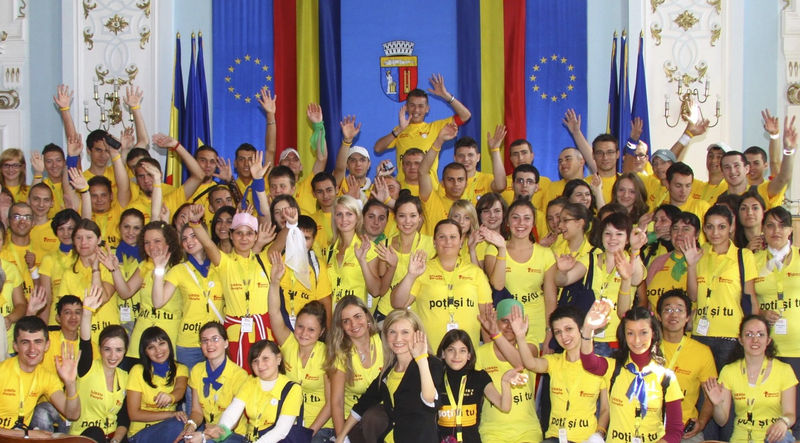 As from the year 2013, the Little People Association has been certified as an independent operator of the program designed to offer the Romanian teenagers and young people aged between 14 and 24 years whom the association has been working with, opportunities for personal development as part of an internationally recognised program. For more information, click here or go to page www.dofe.ro.